Lac has been cultivated in abundance since ancient times.  In Bengal, it was mainly cultivated in the districts of Purulia, Bankura, Birbhum and Medinipur. In 1787, under the stewardship of a young Britisher named David Erskine, shellac manufacture became an organized industry. It was confined to Ilambazar in Birbhum with the resin being brought in from the jungles of the district. Thus, until the first two or three decades of the 20th century or so, shellac dolls of Bengal or Galar Putul were typically found in Birbhum, made by the Nuris, a class of Hindu artisans of Ilambazar, who also made bangles, imitation fruits, ornament boxes and lac-dye (alta). The themes of these clay dolls brightly coloured with shellac ranged from a mother and child, a woman doing up her companion’s hair, a wheat crusher (Gampeshani), a mahout riding an elephant (Hatishowar), a horse rider (Ghorashowar) and endless variety of fruits. These dolls were renowned for their design and workmanship. The tools used by the Nuris for their dolls and toys were : an earthen receptacle with sal wood charcoal; three bamboo sticks of about one foot height each, tied crosswise to each other to form a base for the receptacle; a flat tipped wooden spoon; a flat square piece of timber; a blowpipe made of bamboo; a pair of tongs and a knife with a blunt blade and a handle to drop lacquer. Lacquer sticks or thin slabs of different colours were first held over a charcoal fire and rotated continuously till they softened. The softened sticks or slabs were then moulded and pressed with the fingers to form human and animal figures, fruits etc. Eyes, nose, earrings etc were added on using little blobs of lacquer. Strands of lacquer created by pulling the softened sticks were also used to form hair, eyebrows, moustaches etc. 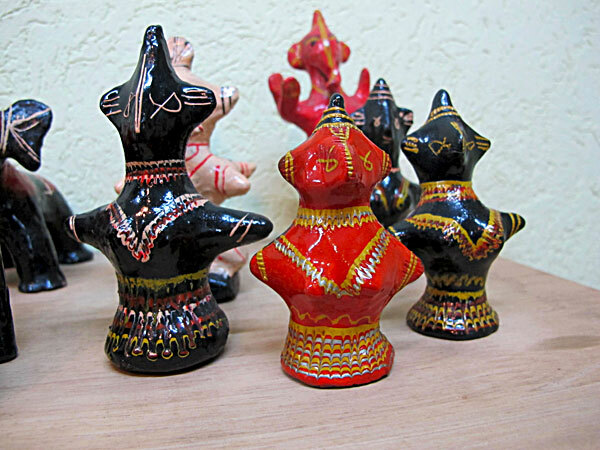 But with the shortage of the raw material, and competition from the earthenware toys of Krishnanagar, production declined by the 1920s and the artisans were compelled to seek other occupations. Most became goldsmiths. Conscious of their plight, Rabindranath Tagore attempted to put some life back into this dwindling art by holding training sessions by Nuri artisans at Sriniketan. However the figures and the decorations on them did not resemble the traditional articles. While the Birbhum tradition ceased to exist, shellac doll making of a different kind was gradually introduced in Bankura and Medinipur districts among the conch shell making community – the Shankharis. These were clay dolls decorated in shellac paint. 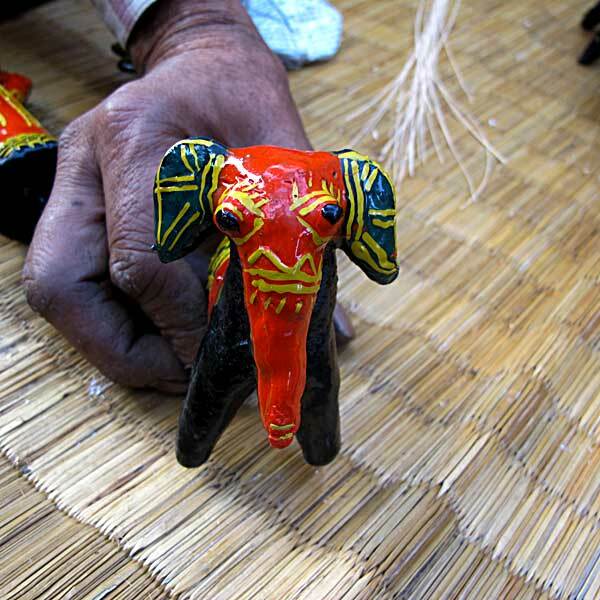 Using similar tools, the Medinipur and Bankura artisans used the lac to colour terracotta toys and dolls. The centres of production were Shankharibazar of Bishnupur and Pratapdighi, Panchrol and Kharoigarh in Medinipur. The traditional method of making these dolls continues to this day. The shellac dolls are about two to six inches in height. Fashioned out of lumps of clay with the use of fingers, they are deftly shaped into figures of gods and goddesses, animals and sundry people, as already described above. The figures are simple yet unique.The horse rider’s figure is made up of two separate components joined together by inserting a thin stick into the back of the horse. The mud for these dolls is collected from termite hills and soaked for two to three days. The advantage of such soil is that it is relatively gravel free and has an adhesive property. The moist soil is kneaded and cleaned until the texture is smooth and then pressed and pinched to form a small doll or toy or votive figurine. The tiny models are dried in the shade for a day and then sun dried before being baked in a domestic oven. The dolls are then to be painted. The dye is prepared first by heating shellac with locally procured paint powder to produce long sticks of painted shellac. The dolls are heated and the paint sticks applied, coating the doll with colour as it touches the heated surface.The backs of the dolls are usually coated in black while different colours are used for the face and body - red, yellow and green being the most popular these days. Thin shellac threads are created from the white or yellow shellac sticks and these provide the decorative flourishes to the dolls. The process of making these shellac threads is known as Guna work. Once dry, these colours will remain fast for at least twenty years. The doll makers of Medinipur and Bankura did not depend merely on local markets, but would also carry their wares to the large Rath Yatra fair held annually at Baripada in Odisha. Thus in villages near the Odisha border under Egra and Potashpur thanas (police stations), there would always a spurt of activity months before the festival. With the Rath Yatra being their largest market, a large number of dolls were fashioned as the deities Jagannath (Krishna), Balaram and Subhadra. But even in its new avatar, lac doll production declined due to a lack of demand. The culprit was, in the main, cheap plastic dolls, which were now readily available in rural fairs. Lac dolls on the other hand were more expensive and could easily break. Yet lac dolls had always been extremely cheap, with practically no consideration for the labour and artistry involved. But, the cost of lac and labour being high, the minimum price could not compete with the cheaper plastic dolls. While volume sales had stood them in good stead earlier, rural demand had plummeted for this once popular toy, outside of the annual fairs. So large scale production was no longer an option. Thus, the craft dwindled and till about the last decade of the 20th century, there remained only seventeen to eighteen families engaged in this trade in Potashpur village (Kharoigarh, Medinipur), while the craft elsewhere in Medinipur and Bankura had completely died out. The Medinipur artisans managed to eke out a living for a few more years, mainly depending on the Baripada fair and local village fairs, but were eventually compelled to shut down shop. Thus where there were more than 40 families across Medinipur and Bankura employed in this craft about fifteen to twenty years ago, this centuries old craft is now dying. What remains today is a lone master craftsman in East Medinipur. Brindaban Chanda is the sole artist who has managed to carve out a decent existence for himself , thanks to earlier attempts at reviving the art by Crafts Council of West Bengal. 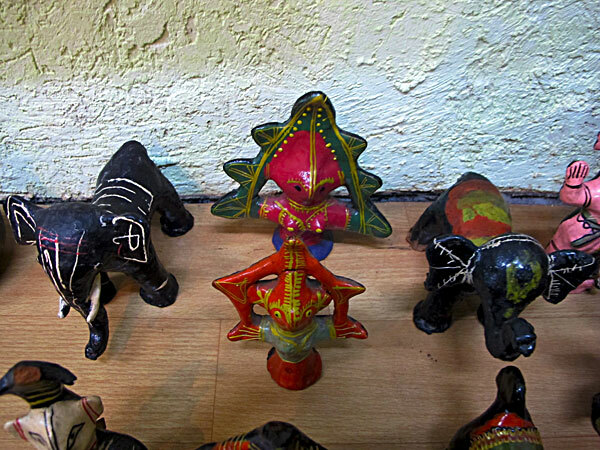 However, there is a little spark of interest in these dolls that is faintly visible at fairs organised in Kolkata - probably as decorative items, which the artists find quite curious. It is hoped that the greater focus being given to lac cultivation in recent times, will also favourably impact the demand for this beautiful art form.